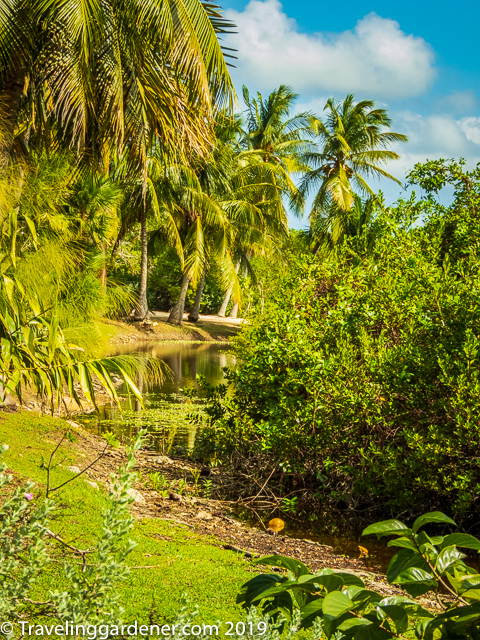 The Cayman Islands has close to 600 bank and trust companies but only one Botanic Garden. The Caribbean Islands are described as paradise, but money isn’t shade, flowers, and food. Without plants, there is no paradise. 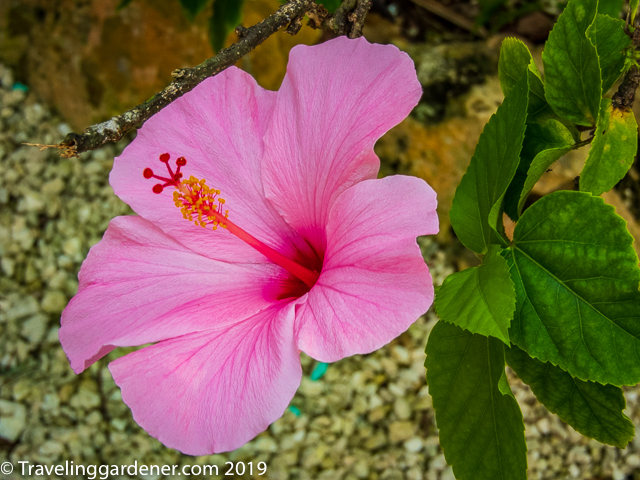 This is my first time in the Caribbean, the temperatures are pleasant in the low 80’s, the breezes are blowing gently, palm trees and colorful bougainvillea in red, pink, white, purple, and orange grow wildly along the roadways. I need practice in relaxing on a beach, I’m not naturally good at it, I don’t sit still easily let alone lie in the sun for hours. Naturally, I set out for the Queen Elizabeth II Botanic Garden, amazingly, a reciprocal admission with my membership in the American Horticultural Society. Queen Elizabeth opened the garden in 1994. 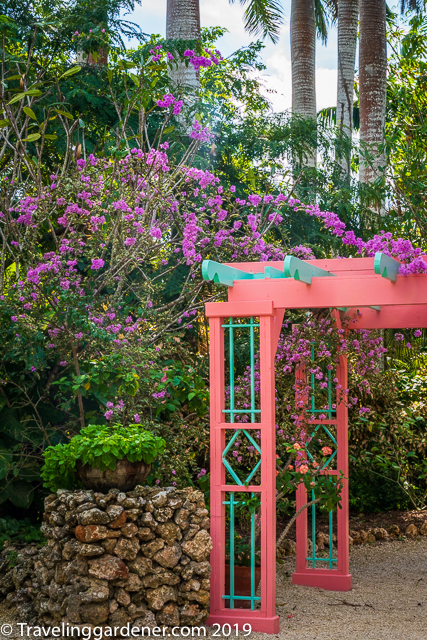 The Garden was established for the preservation of plants, wildlife, and cultural history. 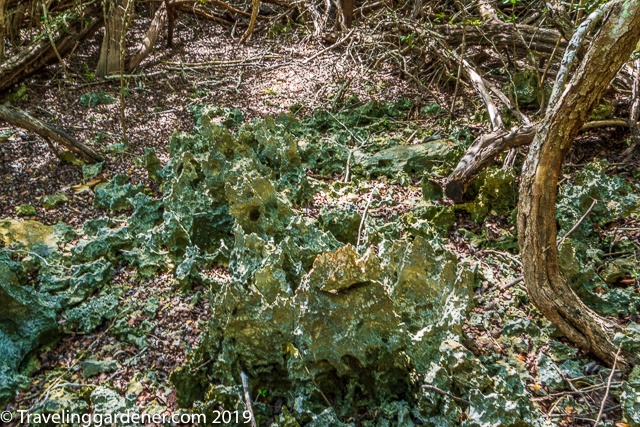 The plants here grow on thin soil with a coral foundation. Trees wrap their roots into the coral for stability. There are orchids, bananas, bougainvilleas, spiky Ti plants, and large shrub begonias thriving here. Orchids are everywhere but especially on the trees of the woodland path and each year the garden holds an orchid show. 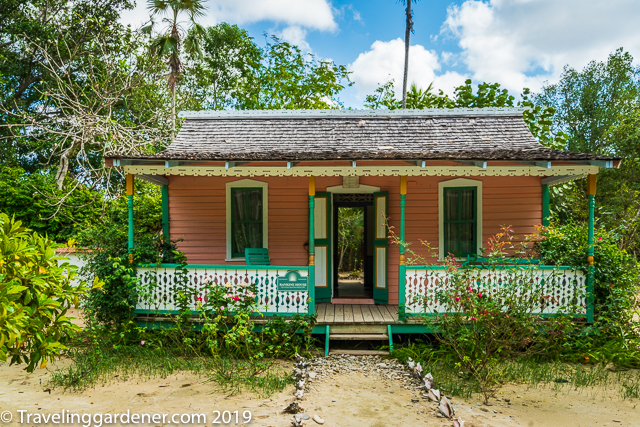 The Heritage Garden surrounds a native Cayman home built in the early 1900s. It was moved here and restored to demonstrate a typical sand garden that would surround such a house. Ornamental plants were surrounded by white sand and pathways were defined by rows of conch shells. Sand garden, ornamental plants surrounded by sand. This home, brightly colored, with scrolled fretwork on the front, has small rooms. You enter the front, and you see straight out the back keeping the house wide open to the breezes. The kitchen is separate from the sleeping rooms where food was cooked on a flat grill. 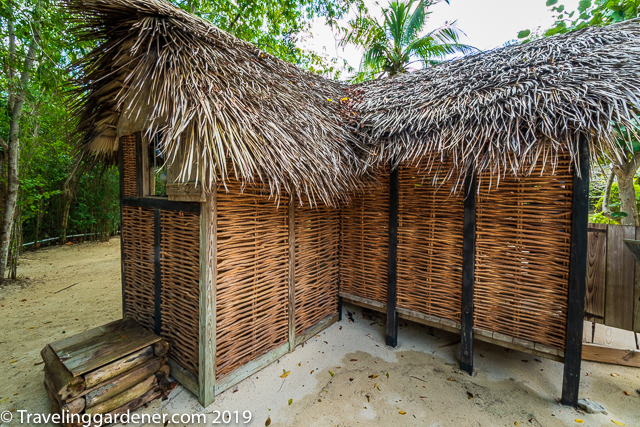 The kitchen roof was made of palm branches with the locked placement of the fronds making a pattern to be admired. 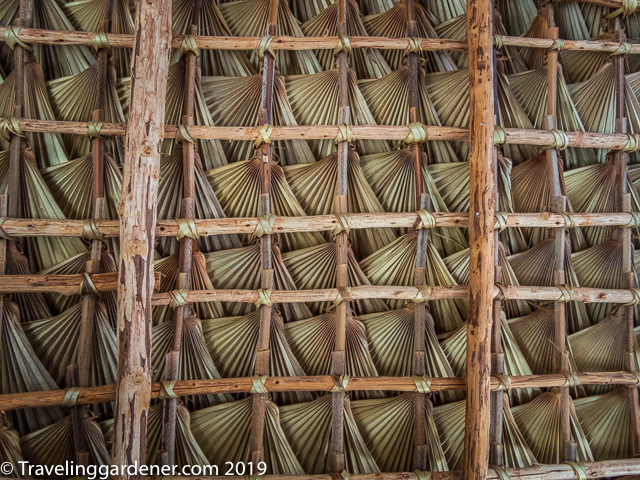 The roof is tight on the inside and thick and high with the fronds on the outside. The tropical fruit trees of Bread Fruit, Bread Nut, Banana, Bay leaf, Cinnamon, Cacao, Nutmeg, and Clove are part of the food supply for this culture. 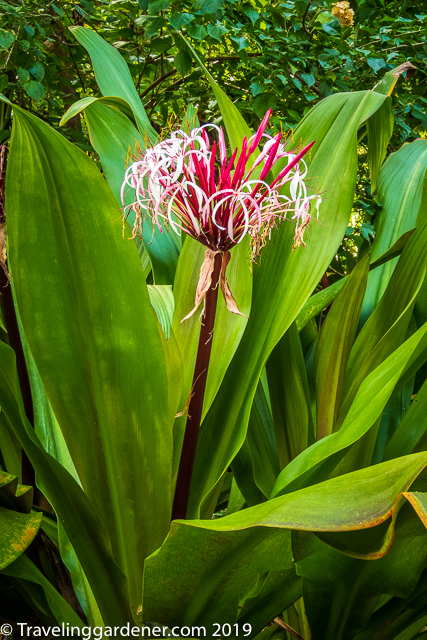 Turmeric and Ginger grow alongside the paths where their tuberous roots can be harvested. A Blue Iguana, check out his feet! The wildlife of the garden was all around us. 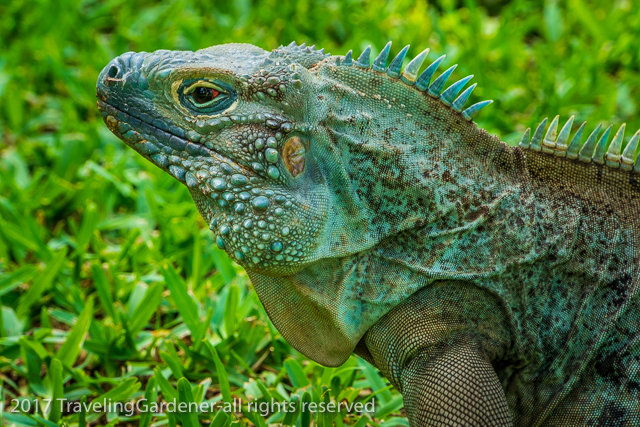 Blue Iguanas live here, their color, the detail of their claws, the crown on their head make them quite something to see. Boldly they hold their gaze right on you. The Cayman Islands are home to 60 varieties of butterflies, five of which are found nowhere else on earth. 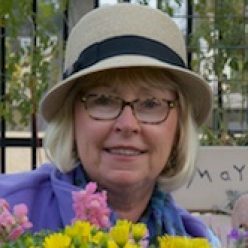 The garden works to provide the plants needed for their habitat. Green parrots, the national bird of the islands, screeched overhead in the trees. 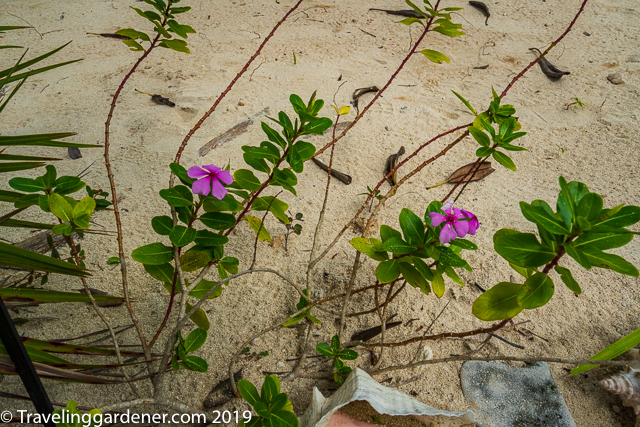 I can’t imagine living on such a small island with a sand garden and year-round temperatures that keep the plants growing happily. Medicines and food growing in the garden, and on the trees. The humidity, which made me drowsy in the afternoon, and the cold rum to quench your thirst would all take a serious change of pace. 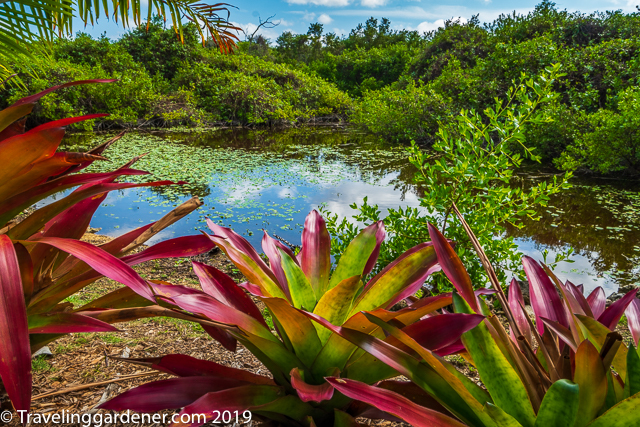 This garden accomplishes its goal for me as a visitor to gain a glimpse of the island culture, the plants, and the critters that live here. Ironically our guide was fearful of going into the garden, she is afraid of snakes (though we didn’t see any and they are only small, non-poisonous varieties on the island) and she is afraid of frogs! No frogs made an appearance. 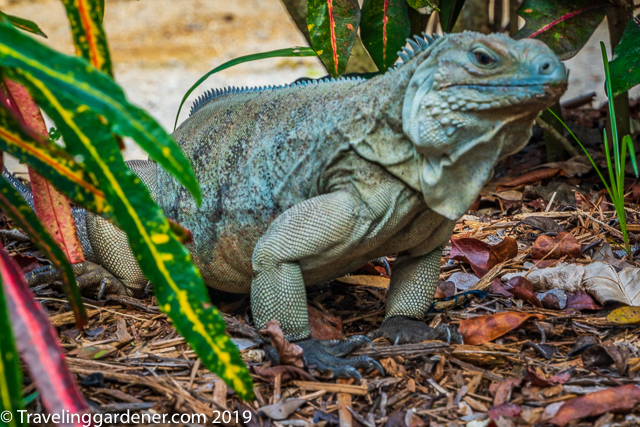 Gardens are so helpful in getting to know a new place and because of my time here I believe I know a little more about the Caymans. But I genuinely don’t understand why there are so many banks, so much money sitting here, and so little of it appears to be benefitting the people who know how to grow spice, food and make great rum drinks. Next Next post: Three Days in Rio!